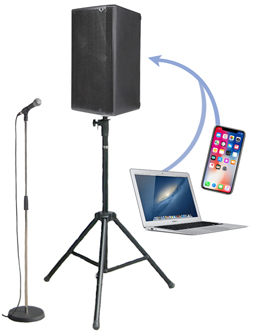 A friendly sound hire service with free delivery, setup and sound check within our 10km Auckland metro area for all package PA sound systems. 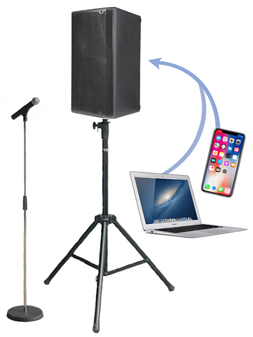 We supply microphones, lecterns, stages, and LCD screens. with an Aux cable to plug in your phone or laptop. $230 includes free delivery, set-up & collect in Auckland metro. $120 you pick up & return, overnight or weekend. Ellerslie depot. One cabled mic, a 600watt 12" speaker plus a little mixer. Includes two aux cables for your laptops and phones. $250 includes free delivery, set-up & collect in Auckland metro. One cordless mic, a 600watt 12" speaker plus a little mixer. Includes two aux cable for your laptops and phones. $300 includes free delivery, set-up & collect in Auckland metro. when you need more bass without adding a sub. $240 includes free delivery, set-up & collect in Auckland metro. 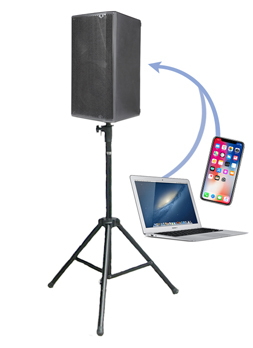 One cordless mic plugs directly into a small 200watt 8" speaker. Includes an aux cable for your laptop or phone. $280 includes free delivery, set-up & collect in Auckland metro. $170 you pick up & return, overnight or weekend Ellerslie depot. One cabled mic plugs directly into a small 200watt 8" speaker. $190 includes free delivery, set-up & collect in Auckland metro. $90 you pick up & return, overnight or weekend Ellerslie depot. $30 vocal mic, Shure SM58 cable, clip & stand. "Thanks very much for helping us in our hour of need yesterday. Your quick response and professional service was outstanding." Kind regards, Dave Brunsdon. Kestrel Group. We can add to this system with a data projector, lighting and staging. 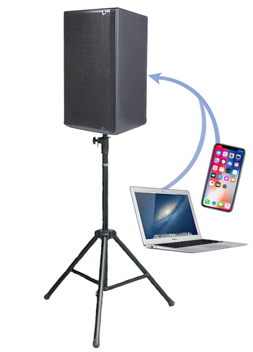 Purchase Option: buy our Ezy Sound System as a basic low cost solution. but check the fine print, our prices include set-up & soundcheck. Depot based at Kiwi Self Storage, 40 Cawley St, Ellerslie, Auckland. Find us on Google+ Maps. We supply speakers, cordless microphones, clip-on lapel and headset mics. PA hire for parties and AV for corporate events, formal speeches, cultural festivals, weddings, bands and DJs. Lecterns for public speaking with projectors, LCD screens, lighting, stages, generators and instals for schools.